Colorful banners on a steel canopy mark the entrance to an otherwise gray and featureless building. Parents and kids waiting for their practice time talk and do homework under banners designed by PDT principal David Webster. PDT designers kept the unobstructed space as open as possible, as it would be in a gym or outdoor sports field, so there is always a sense of activity and movement. 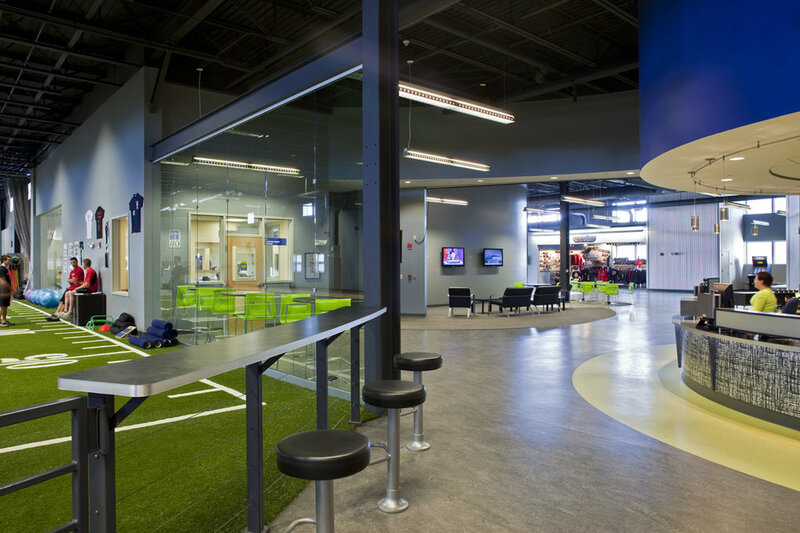 The Performance Center and Parisi Speed School includes a 4-lane, 50-yard track, a weight room, and a turf field. Interior designers used overhead lighting “clouds” to delineate space in this huge former warehouse. The facility contains an entire orthopaedic and sports medicine office, with an x-ray suite and PT center. PDT turned this deteriorating industrial building into a dynamic civic amenity. As part of the growth of its specialized services, Orthopaedic Associates combined a branch office with a sports medicine and training center. Patients can move from treatment to recovery to athletic training in one facility. 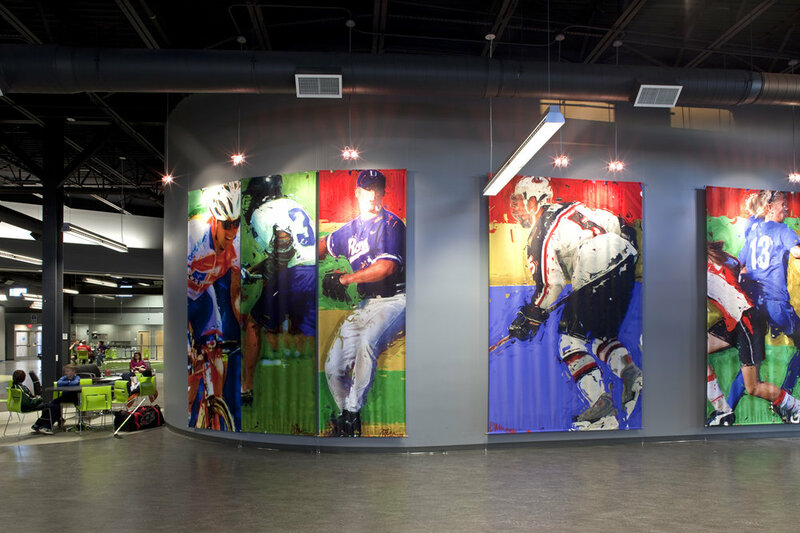 PDT recycled a deteriorating warehouse, retaining the intact structural system and dividing the spaces into orthopaedic services, physical therapy, a hockey rink, and a center for performance evaluation and testing staffed by the University of New England’s School of Medicine. There are also waiting areas and a retail store. A few years later the Michael Phelps Skill Center was added to the complex, with a swim school for all levels, from beginners to competitive swimmers through triathletes. Swimmers train in ergonomic spa pools with adjustable current and video monitoring for coaching sessions. For OA’s website, click here.